For those watching at home and especially for those sitting in the grandstands at Assen, the cancellation of race one on Saturday, and then a planned WorldSSP300 last chance race on Sunday, was a bad end to a promising day - despite the shockingly cold temperatures. Nobody wanted a cancellation, but many felt it had to be so, including race direction. Aruba Ducati’s Chaz Davies voiced his opinion about why the race was first delayed and then had to be postponed, explaining the technicalities. “It was quite obvious what was coming as you could see it on the weather radar and there was just a small window there,” said Davies, meaning a short gap between two heavy bouts of sleet and snow. 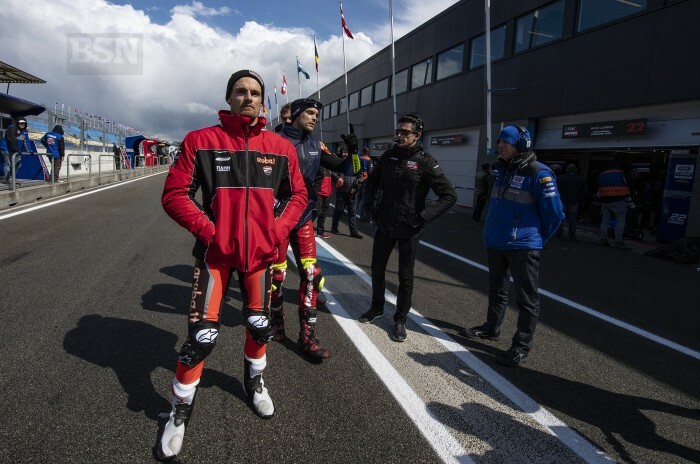 It was all to do with the track temperature being so low it would never allow the wet tyres to warm up to a proper operating temperature, and thus making crashes much more easy to happen. Davies, who spoke about this before the organisers confirmed that there would be two full distance 21-lap races on Sunday, not three, said, “The weather is going to be OK, so you should pack in what you can tomorrow.